Seeing this question, I immediately want to answer with a resounding “yes!” However, it’s a little more complicated than that. Participating in these competitions requires an extreme level of vulnerability as well as dedication. Because it’s so intense, women understandably handle it in different ways. My Miss America sisters and me at Orientation in Orlando. Some become laser-focused on the goal at hand and isolate themselves as a means of protection — or as a means of setting their sights on the prize — while others find comfort through reaching out to others. I don’t believe either extreme is healthy. I don’t think any woman should go in with the sole objective of being friends with everyone but I also believe women shouldn’t completely shut all competitors out. Regarding the latter approach, I’ve heard so many stories from past candidates expressing regret for failing to reach out or closing themselves off. They now look back and realize that they were so focused on the crown that they sacrificed what could have been lifelong friendships; they fixated so much on winning that they failed to understand the real win in making lifelong friends. Miss Utah 2018 Show Us Your Shoes Parade. My take on this is that shutting other people out completely and being unwilling to make friends is wrong. Only one woman walks away with the crown and if that’s the only goal and you don’t walk away as the winner…what do you have? Making an effort to develop friendships leaves you feeling fulfilled whether you win the crown or not and at the end of the day, I would rather walk away as someone who didn’t win but made lifelong relationships rather than someone who won but didn’t make an effort to connect. What’s more, is that the “not here to make friends” approach most times backfires. Candidates who have used this approach have often been mischaracterized as rude or cold which is really unfortunate. The mischaracterization is sad to see but it stems from the fact that most women don’t really know the candidate in question, and so it’s easier to relegate them to the “cold” category than to acknowledge that it may simply be their style of competing. Another downside to the approach is that you stop seeing your competitors as actual women — they just become a number or a roadblock to the goal. This can result in unkind words, backhanded compliments, or severe egotism. Miss Washington 2018 Danamarie McNicholl, Miss South Dakota 2018 Carrie Wintle and me at Miss America Orientation. A few years ago, there was a candidate (I’ll call her Alyssa) who approached another woman in the dressing room as she was changing and said: “hey, I have some great ab exercises to help you if you want them.” The comment was unwarranted and was clearly not delivered in a spirit of kindness. It only created hurt feelings because it was clearly more of a backhanded compliment rather than helpful advice. In a different setting, Alyssa probably wouldn’t have even thought to say something like that, but because emotions were high and she was focused exclusively on the goal, she failed to consider the other candidate’s feelings. If you’re the type of person who needs time alone, that’s completely fine but genuine kindness is still possible. There have been many times where I’ve needed time alone e.g. this past year competing at Miss Utah, I was placed next to a huge group of ladies each night immediately before our opening number production. In order to get into the right head-space, I had to distance myself from the group in order to gear up for competition. I would walk alone backstage and wouldn’t talk because I needed to pray and amp myself up. 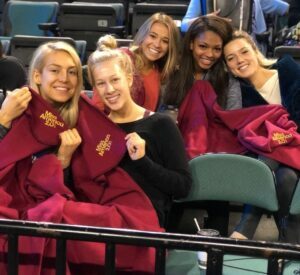 Miss America candidates and me hanging out during Miss America 2019 rehearsals. Following the competition, I would make sure to spend time journaling, on the phone with people I loved, and doing affirmations. It may have meant that I didn’t spend every second with my roommates, but it was necessary in order to be at my best for the competition. I also know of some women who would use headphones just because they needed to not talk at that moment and that is completely fine. You should always do what’s best for your mental health. And if you are around people who promote negativity, I believe it’s better to remove yourself from that group of people because that negativity can hurt your experience. But again, I want to clarify that shutting everyone out because you’re only focused on the win in reality only makes for a loss. At Miss America, I also realized the danger of coming too close towards the opposite end of the spectrum. Because I was very much aware of how limited our time was, I wanted to become good friends with all my sisters from each state. But everyone competes in a different way, and even though I was open to bonding… that didn’t mean that every candidate was. 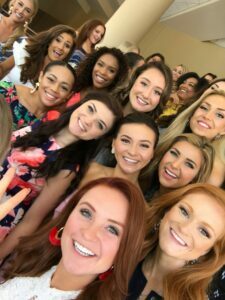 Miss America 2019 candidates in Orlando. July 2018. There were a few candidates with whom I was trying my hardest to bond with and they just weren’t interested. At first, it really hurt my feelings because I had figured we were all on the same page and wanted to become friends. But I had to realize that investing my energy in relationships where the other person wasn’t open to connecting only resulted in me feeling drained and discouraged. I became frustrated and sad because I was making such a huge effort to reach out and it wasn’t being reciprocated. It was a great lesson for me that everyone competes in different ways; if other people don’t want to open up then don’t force it. It doesn’t mean that the person has anything personal against you — it just means that they handle competition in their own way. I love all my Miss America sisters and now we’re all so close. But during competition, it makes sense that some dealt with the pressure differently than I did. If others don’t want to be friends that’s fine! Just make sure that you don’t try so hard that it ends up diminishing your happiness. Finding balance is the key. During my final time competing at Miss Utah, I decided I only could spend time around people who were positive and wouldn’t take away from my positive mindset. I still made sure to be kind to everyone but, for the sake of my mental health, I had to put a little distance between myself and a few people who were more prone to negativity. I focused on developing relationships with women who were optimistic, uplifting, and who I could turn to in moments where I needed strength. Golfing with my Miss America sisters in Orlando! 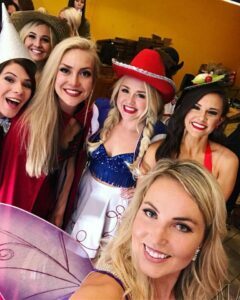 Had it not been for meeting so many incredible women and having them affect my life in a positive way, I don’t believe I would have become Miss Utah. The time we spent laughing at lunch and in the limos, staying up late ordering Buffalo Wild Wings and sharing about love lives, cheering one another on during our performances, and more, are memories I will never forget. The lifelong friendships I developed are my true treasure and I get to keep them even when the crown comes off. Bottom line: do what is best for you! Each woman is different and your balance will look different than mine. Just make sure that you maintain your perspective about what’s actually important. Thank you thank you for writing this!!! I love that you have given so much thought to this question. I am so impressed with your self awareness of how you felt at Miss America. It would have been so easy to continue looking at that situation as a group of mean girls. But I love that you saw in them just a different way of handling their stress and competition. I admire that you were able to come to a point where you realized it wasn’t about you. That takes high levels of emotional intelligence. My teen daughter who is competing in a pageant soon has struggled with this very question. We both enjoyed this article very much and it has helped her to really give more thought to the difficulties that she has faced in competing in pageants thus far. Thank you for being an amazing role model.